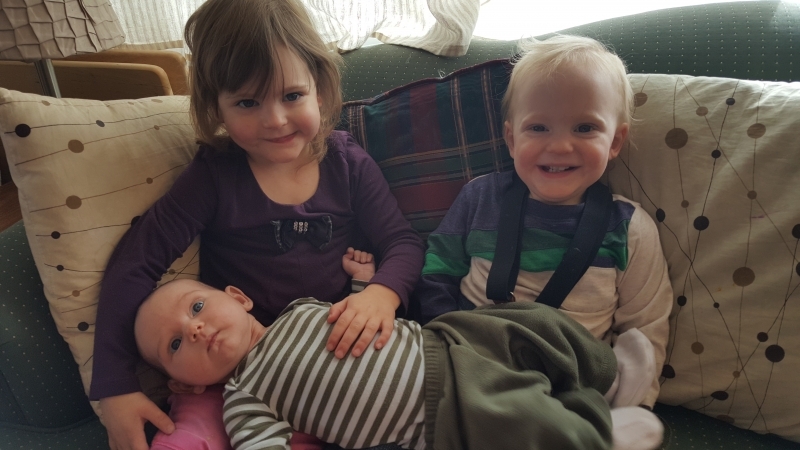 Going from four children to three (in a good way) is a strange experience. In a life that generally just gets harder and harder (as we add new children and new developmental stages), things suddenly get that much easier. The kids all fit in one row of the Expedition, allowing me to enjoy the full back for groceries. The number of children is only one more than my number of hands. It’s that much easier to coordinate nap times. I start to feel like I’m on top of it all, like I’ve got strength in myself to handle anything, like I don’t need anyone. And then we do weekend respite for a two-month-old on the same weekend Daniel was volunteering for something and we were having people over and have a Sunday night meeting at church. And I’ve been disabused of any secret thoughts I’d been harboring of my self-sufficiency. I was in church leadership somehow, so I was supposed to watch the DVD on church growth strategies – but I was also a college student on spring break. I’d decided to take my spring break at my grandparents’ farm, so I sat on their living room floor and took notes as I watched the DVD on their television. If I remember right, the basic gist of the DVD was that you needed to identify what your church’s greatest weaknesses were – and bring them up – and then you needed to identify what the new weaknesses were and so on and so forth. Kinda a “you’re only as strong as your weakest link” idea. Or something like that. Honestly, I don’t really remember much at all from that far ago DVD. What I do remember is what my grandma said after I was done. She’d been doing little household tasks in the background while I’d been watching, and had clearly been paying attention. I recognized the wisdom of her gentle rebuke then – but I realize it much more now that I’ve lived another decade or so. There are plenty of good strategies out there. There are things we can do to make ourselves better. Things we can do to improve our communication skills or our parenting skills or our connections. There are things we can learn about how to evangelize or study the Bible or create a welcoming environment. But ultimately, what we do isn’t even half the picture. It’s God who changes hearts – ours and those of the people around us. It’s God who heals relationships. It’s God who saves. It’s God who transforms. It’s God. Prayer reminds me that all the strategies in the world are useless unless God is in an endeavor. I dutifully recorded the lists in my prayer app (PrayerMate) and began praying for each of my children in each of the suggested categories. It’s the prayer I keep coming back to. May my children desire relationship with God. May they see their sinfulness. May they see the worthlessness of their own striving. May they fall upon the mercy of Christ. May they grow in the grace of the gospel. Save my children, O Lord, I pray. It’s easy to think that contentment is a function of our circumstances. If only I had x or y, I would be content. But when x or y arrives, we find that something new is necessary for our contentment. When we find ourselves in difficult circumstances, we might be tempted to think that if only we had done something differently we could have been content. I could have been content if only I’d chosen a different major in college, not taken out the loans I did, taken this job offer instead of the other. I could have been content if only I hadn’t married when I did or the person I did. I could have been content if we’d have chosen to buy a different house or to build instead of buy (or vice versa). I could have been content if I’d have had fewer children farther apart – or more closer together. But Elinor Dashwood’s reflections upon Mr. Willoughby’s character in Sense and Sensibility should be instructive. A discontented heart finds something with which to be discontented regardless of circumstances. A contented heart learns to be contented in all circumstances. I am challenged as I look at my own life, at the woes I pour out upon my husband each day when he returns from work. No matter how good a day may be, I always can find something to complain about. My heart is too often a discontented heart, considering whatever I currently lack (whether it be sleep or a clean house or quiet children or chocolate) to be of far more importance than any of the many things God has granted me. If I get all the sleep I desire, but am not content, I will still be just as crabby as I am now. If I had a clean house, but not a contented heart, my soul would be just as shabby. If my children were quiet, but I was discontent, the clamor of my own heart would be enough to disturb the peace. Because contentment is not a function of my circumstances. Contentment is a habit of the heart. And contentment is learned through practice. In Christ’s strength, I can learn the habit of contentment. But to call me superwoman implies that somehow I have innate, superhuman powers that enable me to live with the circus that is our little family. When I had one child, newly home from the NICU who screamed and screamed and screamed, that ear-splitting Nazgul scream many times larger than her body…I could never do it. When she only slept lying on top of me but never relaxed into my arms. When the sleepless nights stretched month after month throughout the whole first year…I could never do it. Yet somehow I did, by the grace of God. And then I had two children. Another infant fresh from the NICU, this time with a toddler as well. They tag-teamed sleeping, except when neither would sleep. I learned the definition of touched out…I could never do it. Now that I had a toddler, I couldn’t keep the infant away from colds. So we got one after another after another, stretching my body to what was surely its limit with lack of sleep…I could never do it. And then I had a third child and my pelvic floor collapsed. The prolapse came with unrelenting pain when I sat, stood, or lifted – tasks a mother of three cannot avoid. Therapy was long and hard and took time I didn’t have….I could never do it. And then child number 4 arrived with a schedule to make home-loving me flinch. And my grandpa died so we took an emergency trip to Nebraska. And then the kids got sick. And then… And then… And then… I could never do it. But somehow I am, by the grace of God. But this, at each stage, is the task God set before me. Refusing to do the task is not an option. My only hope is to trust God. And that, I think is what you miss. Unbelieving woman, you think I’m superwoman because you recognize this task requires superhuman strength. It definitely does. But that strength could never come from me. Sister-in-Christ, you may think I’m superwoman because you are terrified that God might call you to such a task – and you want to believe that only the specially gifted or the especially patient (let me tell you what, that’s NOT me) can handle such a task. But God gives grace for the tasks he gives during the task, not before. Sister, this task of mothering, of fostering, is not for superwomen. It’s for women who could never do it, but somehow do, only by the grace of God. Most of the time, when I read this quote on a pretty background while scrolling through Pinterest, I roll my eyes. That is everything that is wrong with parenting these days, I think. Parents are just too absorbed in their children. And then my baby gets her first cold. I remember it with Tirzah Mae, a few weeks after she came home from the hospital. She was snuffling and gasping and we’d been trained into terror of RSV by the NICU staff. Even knowing that Tirzah Mae’s cold was just a cold, I still felt with every labored breath that my heart was rattling outside my chest – and that said heart was just about to break. Somehow, it doesn’t get easier. Beth-Ellen was a term baby. Her objective risk of serious complications of a cold is lower than the other children’s risk was. I’m a more experienced mom and have weathered dozens of colds. But when Beth-Ellen got a cold this weekend, at just shy of six weeks old, my heart was out there coughing. And when she lost her voice and could only squeak instead of screaming? My heart, oh my heart, squeezed until it’s crushed. And when she started wheezing with every breath in and out? I was sure she was dying – and that I was dying with her. And just as I’m about to wake my husband and tell him we need to head to the ER (but am worried because, for some reason, it seems like every time we go to the ER, the problem resolves while we’re there and I look like a fool) – anyway, just as I’m about to wake Daniel and head off to the ER, I remember where my heart actually belongs. My heart doesn’t belong in my children’s chests. It doesn’t even belong in mine. My heart belongs to God. Sure, I’d prayed for Beth-Ellen at our evening devotions, and earlier when she’d come up in my prayer app. But during all this worrying? I hadn’t been entrusting her to the Lord. I stopped. I confessed my lack of trust. I prayed for healing and for wisdom to know when to have Beth-Ellen seen. I entrusted my daughter to God’s care, entrusted my heart to him. And the labored wheezing settled, the noisy breathing calmed, the restless sleep eased. My daughter slept in peace. And I did too, my heart still walking outside my body, but this time walking with the one who holds it – and my daughter – so tenderly. My heart and my daughter can find rest in God alone. To paraphrase the Psalmist: Why so troubled, O my heart? Put your trust in God! After 55 hours of labor, we were pleased to welcome Beth-Ellen Irene Garcia into the outside world on Christmas Day. She was born at 42 weeks, just like her mother before her, and, by the grace of God, via an unmedicated vaginal birth after 2 cesarean sections. She is the answer to prayer, a delightful Christmas present. But, as the reporter from our local news forced me to clarify, Beth-Ellen is not the greatest Christmas present ever. Rejoicing in the Incarnation – and in this precious gift we get to share Christ’s gift with. We knew even before we had children that we wanted family worship to be a thing in our household. We also knew that the thought of family worship was overwhelming and intimidating. We knew how hard it could be to be consistent in personal devotions – and how many times we’d stopped and started at attempts to spend devotional time together as a couple. How on earth could we do family worship? It just so happened that we have children who don’t do a great job at sleeping – and I started reading Tirzah Mae a Bible story from The Children’s Bible in 365 Stories by Mary Batchelor (which my mom gives a story a baby shower gift) every night before putting her to bed. Then, last Advent, I got out the Advent wreath and we made a point to light the appropriate candles and sing a Christmas hymn after supper each evening. As we got ready to put away our Christmas decorations, it struck us that we’d been complicating the idea of family worship overmuch – and that we were missing out on a great opportunity to train our children as a result. We combined the Bible story I’d been reading with the hymn we’d made a habit of singing, added a time of family prayer at the end – and now we have family worship almost every evening. It turned out to be that simple. We get the kids in their jammies after supper and then choose a hymn to sing. We read from a story Bible (we’re actually reading through The Ology by Marty Machowski right now, having gone through the Old and New Testaments in story form twice now – we plan to alternate going through the storyline of Scripture and doing something more theological/doctrinal like this.) Finally, we pray together – Tirzah Mae and then mama and then papa (Louis isn’t quite talking yet.) Then it’s kisses and toothbrushing and off to bed. Simple and totally doable, now that we quit complicating things so much. It’s a question Tirzah Mae asks me a half dozen times a day. It’s a question I love to answer because it forces me to listen to the music that’s on, forces me to articulate the message in simple terms. But this time, the question discomposed me. We were in the car listening to a random “Christian” CD we’d borrowed from the library. A “Christian” CD that was basically the prosperity gospel set to music. I told my daughter that God promised that we would have hard times, but that those who believe in Jesus have Jesus to walk with them during the hard times on this earth – and that those who believe in Jesus have the promise that God will set everything right in the end. And then I had to stop lest the tears obstruct my ability to drive. But I kept thinking on the promise of God for a good long while. I was moved to worship the God who has overcome this world – even though all has not yet been put to right. And I was moved to pray for those pitiful souls who are clinging to a false promise of ease in this life and do not know the joy of trusting Christ for what HE has promised (and will surely bring to pass). Tirzah Mae’s question was a simple one – and one I didn’t really know how to answer – but the process of attempting to answer it turned what had been background noise (and theologically incorrect background noise at that!) into an opportunity to worship God and pray for the lost. Take heart, dear believers, who feel on the bottom of the world – whether because of a job you hate, an income that doesn’t seem to make ends meet, relationships that are broken, health problems that seem insurmountable, or any other thing. Take heart, Christ has overcome the world. And, if you have been placing your hope in this world – in the pursuit of fame and fortune and comfort and family or in any other thing – know this, those things will never satisfy. All the hope this world offers is hollow. Place your trust in Christ – he has overcome this world. Tirzah Mae peeled the barcode off her new water bottle and affixed it to her shirt. I noticed it on our way out of the grocery store and began to tease her. I contemplated adding the numbers I knew, the ones I’ve quoted to others. I thought back to my question: “Are you a bargain or are you pricey?” Yes. I didn’t quote that number to my daughter, couldn’t quote that number. So she is. And so are you.